I can't really think of any movie where part two was good, let alone part three. Hell, by part three, the original cast is nowhere to be found. Yeah, I'm looking at you Hostel III. What the hell was that mess all about? Back To The Future goes above the call of duty, when it comes to making a film. They don't try too hard. I feel as if they could have done more then three, everybody would have been good with that They did what few have done in film, they left us wanting more. They left us wanting more then just more movies. They left us wanting the sneakers. You know the ones that Marty Mcfly wears. I loved the sneakers so much from the movie that I had to be one of the people to own a pair. They don't come with power laces tho. Seventeen-year-old Marty McFly is accidentally sent back in time from 1985 to 1955 in a time machine built from a DeLorean by eccentric scientist Emmett "Doc" Brown, when Marty is attacked by Libyans from whom Doc stole the plutonium that gives the flux capacitor the 1.21 gigawatts it needs to time-travel. Soon after his arrival in 1955, Marty's mother Lorraine falls in love with him, rather than with his father George McFly, threatening to cause a paradox that would result in Marty's nonexistence. Without plutonium to power the time machine, Marty must find the 1955 Doc Brown to help him reunite his parents and return to 1985. The efforts of Biff Tannen, George's bully and supervisor, further complicate Marty's situation until Marty successfully causes his parents to fall in love and simultaneously convinces George to finally stand up to Biff. Returning to the future via a lightning strike that jump-starts the machine, Marty discovers a vastly improved situation for the McFly family, as Biff is now an auto detailer rather than George's supervisor. Despite 1955 Doc's insistence on not knowing details of the future, a note Marty leaves in his pocket saves him from being killed by the terrorists. But in the film's final moments, Doc Brown appears in a modified version of the DeLorean and tells Marty and his girlfriend Jennifer Parker that they must travel to the future to fix a problem caused by Marty and Jennifer's kids. The series continues as Doc Brown travels with Marty and Jennifer to the year 2015 where he has discovered Marty's family is in ruins. Marty buys a sports almanac containing the outcomes of 50 years (1950–2000) worth of sporting events. However, Doc catches him and throws the almanac in the trash, where the 2015 Biff Tannen finds it. While Marty and Doc are at Marty's 2015 house, 2015 Biff steals the DeLorean time machine and gives the book to his 1955 self just before he goes to the dance at the end of the first movie. When Doc and Marty return to 1985, they find that Biff has used the sports almanac's knowledge for financial gain, which allows him to turn Courthouse Square into a 27-story casino, take over Hill Valley, get away with the murder of Marty's father, and later marry Marty's mother. Marty learns that Biff was given the book by 2015 Biff on November 12, 1955, so he and Doc go back to that date in order to steal the almanac from Biff before he can use it to destroy their lives. They accomplish this in a complex fashion, often crossing their own past-selves' paths. 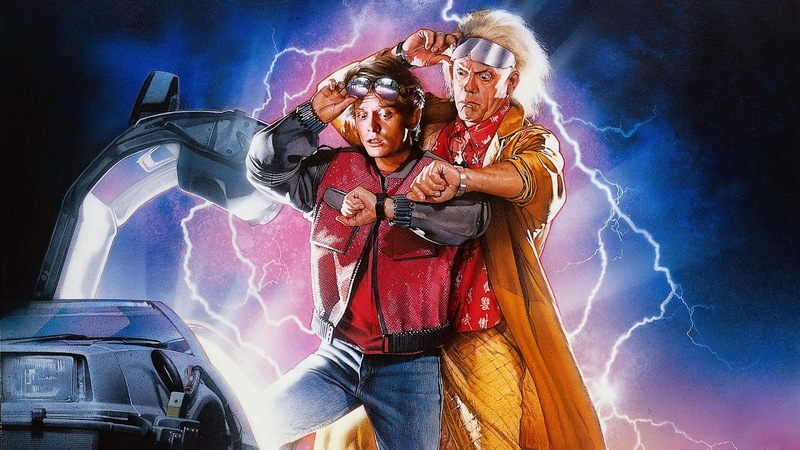 When the duo are about to travel back to 1985, a lightning bolt strikes the DeLorean and activates the time circuits, sending Doc back to 1885 and leaving Marty stranded once again in 1955. After finding out that Doc Brown is trapped in 1885, Marty sets out to find the 1955 Doc to help him fix the DeLorean (which has been waiting for him in a mineshaft for 70 years) and restore it to working order. Learning that Doc gets shot in 1885 by Biff's great-grandfather, Buford "Mad Dog" Tannen, Marty travels back in time to save Doc (who has become a blacksmith) and bring him back to the future. Arriving in the middle of a melee between the United States Cavalry and American Indians, an Indian arrow rips a hole in the Delorean's fuel line, emptying the gas tank and rendering the engine useless. Inadvertently due to Marty's arrival in 1885, Doc falls in love with schoolteacher Clara Clayton, and considers staying in the past. Marty must convince Doc to come back with him and find a way to get back to his time before it's too late. After several dramatic action scenes involving using a speeding locomotive to push the Delorean to 88 miles per hour (142 km/h), Marty returns to 1985 without Doc Brown, who stayed behind with Clara in 1885. When the Delorean appears in 1985 on the same train track as planned, a modern train destroys the Delorean, with Marty jumping out just in time. Marty reveals to Jennifer the time travel adventure and they visit the scene of the wreckage of the Delorean. He worries that Doc has been lost in the past forever, when suddenly Doc Brown appears in a new time machine, modeled after a locomotive. He introduces Jennifer and Marty to Clara (to whom he is now married) and his two sons, Jules and Verne. When Marty asks if Doc and his family are going to the future, Doc replies that he's "already been there." Doc's last words of wisdom is that nobody knows their future, so they "must make it a good one." The locomotive flies across the sky and disappears, ending the trilogy.